Triple symptom relief: heartburn, indigestion and trapped wind. Sugar free mint flavour.Calcium Carbonate, Magnesium Carbonate, Simeticone Rennie Heartburn, Indigestion & Wind relief combines 3 ingredients which together provide triple relief to help fight against 3 key digestive health issues - Heartburn, Indigestion & Trapped Wind. Containing an antacid the tablets work fast to neutralise excess stomach acid directly at the source - relieving indigestion & heartburn. The formulation also contains simeticone, a highly effective ingredient which relieves painful trapped wind and its associated symptoms of uncomfortable bloating, pressure and fullness after food. The simeticone acts gently to disperse the trapped air bubbles, helping to eliminate the symptoms discreetly and without embarrassment. Read the package leaflet before use. Dosage: Adults and children over 12 years: 1 or 2 tablets to be sucked or chewed, as required, up to a maximum of 11 tablets in 24 hours. Prolonged used should be avoided. 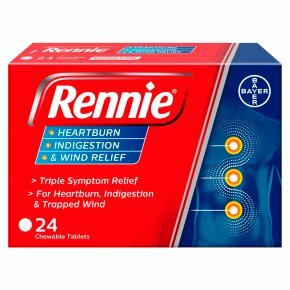 Rennie Heartburn, Indigestion & Wind Relief may be taken during pregnancy and breast-feeding. Children under 12: Not recommended.<br>If symptoms persist after 14 days consult your pharmacist or doctor.<br>Keep out of sight and reach of children.